The former vocal leader of the Catalan group Ojos de Brujo, Marina Abad, had organized to perform at the Festival Méditerranée of Ashdod (south of Israel, next to the Gaza Strip) the upcoming 11th of June, next to other Spanish artists such as Tomatito, Diego Guerrero, Rycardo Moreno and Javier Limón. Marinah's concert was part of the Idan Raichel Project, where the Portuguese António Zambujo will also perform. The Valencian artist had also planned to sing at the World Music of Tel Aviv. As soon as we grew aware of these concerts, several BDS Catalunya activists asked Marinah via social networks not to sing in Israel, since it would represent a violation of the cultural boycott the Palestinian civil society is asking for. Knowing how supportive Marinah is of international causes and social movements, we thought it was a paradox that she had decided to participate in a festival organized by the same Israeli regime which has been oppressing the Palestinian people for the last 67 years. After several phone conversations, Marinah has decided to cancel her two concerts in Israel. This important victory for the BDS has been achieved some days after the American singer Lauryn Hill (former singer of The Fugees) decided to cancel her concert in Tel Aviv, due to a strong international campaign asking her to not violate the call for cultural boycott launched by the Palestinian civil society in 2004. The artist didn't disappoint us and decided not to sing for Apartheid. The Festival Méditerranée of Ashdod is a clear example of how Israel uses culture to whitewash its image and show itself to the world as a modern and open-minded country, hiding its occupation, colonization and apartheid policies. By giving an image of multiculturalism and tolerance, this festival is covering up the Zionist colonizing machine, and is trying to show Israel as a «normal» country. If we look at the sponsors and organizers of the festival, it's obvious how they are closely linked to the violation of Palestinian rights. Among the sponsors there is Tfahot, a bank which finances illegal colonies in occupied West Bank; Ashdod port, which exports agricultural products produced in stolen land; Adama, a food company linked to the company Agan-Machteshim, which produces glass fibre in an illegal Jewish colony; and wide institutional support of the Jewish state (Ashdod Council, the Ministry of Culture of Israel and the National Lottery). As is established by the PACBI (Palestinian Campaign for the Academic and Cultural Boycott of Israel) guidelines “a cultural event is boycottable if it is partially or fully sponsored by an official Israeli body or a complicit institution”, and as we have already mentioned this Festival is a clear example of the above. We want to emphasize that Marinah has announced the news today 15th May, the day we commemorate the Palestinian Nakba (the «disaster» in Arabic), which started 67 years ago. On the 15th of May of 1948 the State of Israel was created, forcing 70% of Palestinians to leave their houses and dispossessing hundred thousands of them from their homes. The Nakba is not an isolated event in time, but an on-going event which keeps being repeated systematically. For 67 years now, Israel has been violating, without been punished or sanctioned, the Palestinians rights and their freedom, increasing its attacks in the recent years. Today we remember the Nakba. 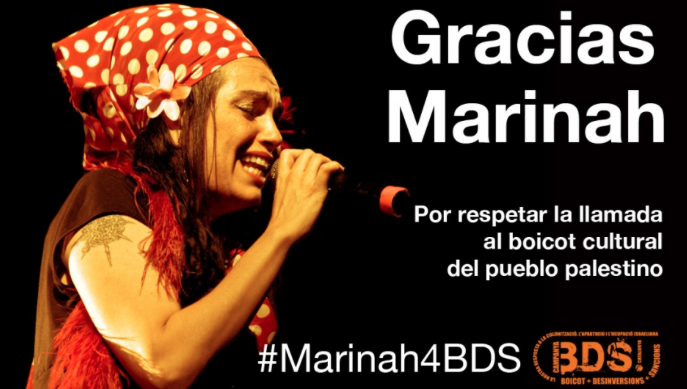 BDS Catalunya and RESCOP celebrate Marinah's decision and we fully support her. We want to emphasize the importance of her decision, since she is the first Spanish artist to cancel a scheduled concert in Israel. Marinah has set an example of compromise, values and solidarity which we hope encourages the rest of Spanish and International artists to intensify cultural boycott against Israel. From BDS Catalunya and RESCOP we won't stop calling for BDS until Israel: 1/ ends its occupation and colonization of all the Arab territories occupied in June 1967 and dismantles the Apartheid Wall; 2/ recognizes the fundamental rights of the Arab-Palestinian citizens of Israel to full equality; and 3/ respects, protects and promotes the rights of Palestinian refugees to return to their homes and properties as stipulated in UN resolution 194.